In Japanese, all consonants are combined with one of the five vowels from the previous lesson. There is one exception to this rule, but we don’t need to go over it until the very end of the discussion on consonants. I don’t want to throw all of them at you at one time, so we will take them in pairs of two per lesson. 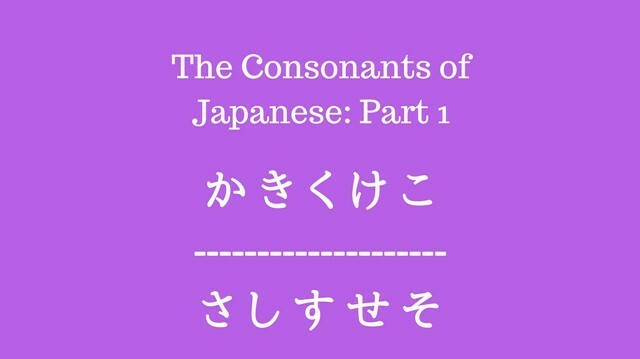 This first lesson will be covering the [k] and [s] consonants in Japanese. Listen again to the し sound in the second group. This is a perfect example of a sound in Japanese that is close to, but isn’t quite the same as English. When you make this sound in English, it feels as if the “sh” sound is being created in between your lips and your teeth. Try it now and see what I mean. When it comes to making the し sound in Japanese however, it feels like the sound is being created in the middle of the inside the mouth. It’s a different feeling from the English counterpart, and also a slightly different sound. Keeping with the philosophy of “following your ears” go ahead and listen to that particular sound a few more times and try to recreate it yourself. Don’t worry if you’re beginning to feel like this is a lot of work. It usually seems that way at first, but once you get used to them they become rather easy. It’s kind of like how you can use all 26-letters (x2 for upper case) in the English alphabet without any problems. Here are some new words that illustrate what you’ve learned so far. Remember, it’s not important to memorize the English meaning. Just listen to them and get used to how they sound. Listen to and repeat each sound a minimum of three times. Pay special attention when you listen to and repeat the し sound in particular. Write out each hiragana on a piece of paper a minimum of five times. Listen to and repeat aloud each example word a minimum of three times. Go Back to Lesson 3!